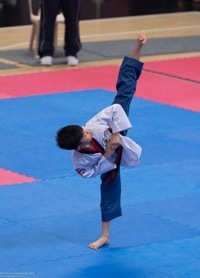 On 20th and 21st, January was The French Open Poomsae Championships which was an A-Class Competition. This was the first poomsae event of the year and was host to very high standard judges and European/World level competitors. Large categories saw players with over 60 competitors against them, and for many of the new GB Squad members, this was their first International Championships. Day 1 was the Senior Divisions, but unfortunately, there were Organisational, technical problems and this made for a messy U30 & U40 elimination division (red against blue – winner goes through to the next stage). Disruptions to the running order also meant that many players did not compete until very late in the day/evening. 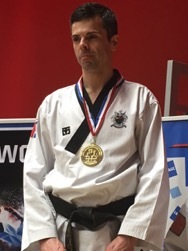 Despite these difficulties, there were some fantastic performances and well-deserved medals Master Simon Negus took Gold in the U50 Male division against 23 competitors. 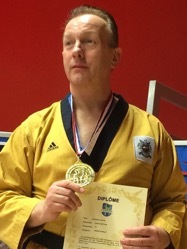 The 2nd Gold GBR Medal of the day went to Master Peter Johnson in the U65 Male division. 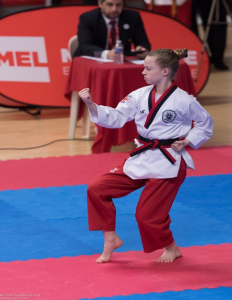 Other medals from Day 1 included ‘Magic’ Mike Pejic in an excellent performance winning Silver in +66 Male, Bronze for Master Yousuf Dildar in the U60 Male division, Bronze for Wenqi Li in the U40 Female division and Bronze for Simon Negus & Wenqi Li in the +31 Pairs. Day 2 for the junior divisions was a lot smoother running and also saw the GB Poomsae Squad collect 4 Silvers and 3 Bronze medals. The individual categories were extremely tough with between 27 and 51 players in each. 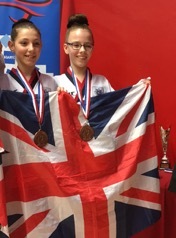 GB players Natasha Wilson in U14 Female individual and Nino Ontoy in U14 Male individuals both put in highly competitive performances to take Silver medals. It was also a good day for the U14 Teams. 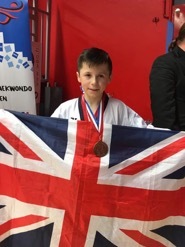 The male team of Joshua Tobin, Timi Akinrele & Noah Adams taking Silver, the U14 Female team: Cara Coull, Donna Nguyen-Harrison & Leyla Palser taking Silver, and the other U14 Female team: Megan San, Olivia Shaw-Wilkinson & Thiassa Ashanti Goncalves taking Bronze. 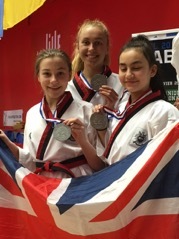 The U17 female team also took home bronze after a very close final: Tahya Fells, Madeline Lilley, Ella Atkins. 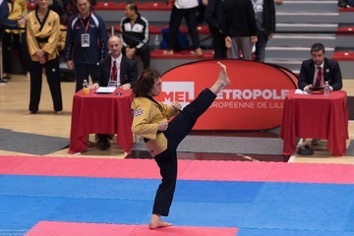 Another highlight of day 2 was the junior Freestyle division where GB had one competitor 12-year-old Aidan Palmer who performed a fantastic routine to take Bronze in the U17 division. 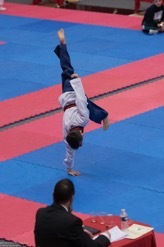 After winning Gold at the National Championships, this was only his 2nd ever competition. Overall it was a successful Championships, and the High-Performance Coaching Staff are extremely happy with the progress and performance of all the players.